The Creamline Cool Smashers display their medals and trophies after bagging the PVL Season 2 Reinforced Conference crown via sweep over the PayMaya High Flyers. 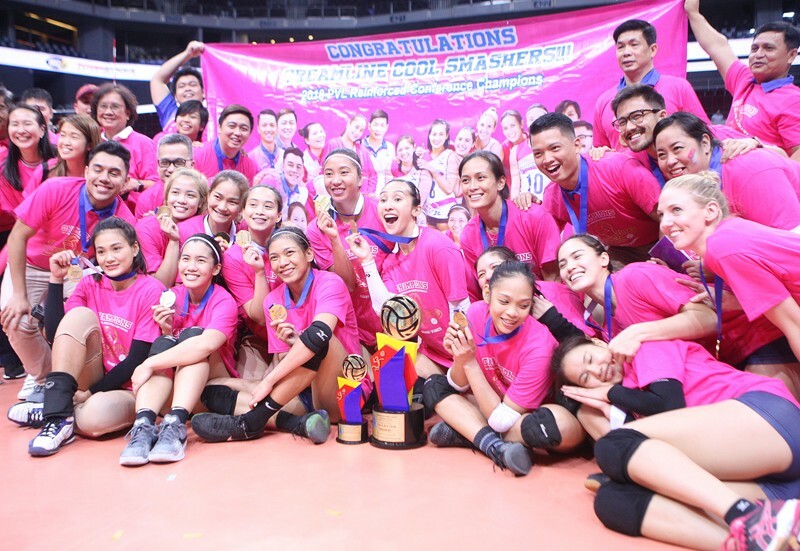 Creamline delivered as promised – winning its first-ever Premier Volleyball League crown in a fashion powerhouse teams are expected to churn out – via sweep. The Cool Smashers outhit and outclassed the High Flyers from start to finish and came away with a lopsided 25-19, 25-20, 25-11 result to claim the PVL Season 2 Reinforced Conference diadem before a huge Wednesday crowd at the MOA Arena. The top seeded Cool Smashers, coming out with the same intensity and determination they showed in their 25-21, 22-25, 25-20, 25-19 triumph in the opener of their best-of-three series last Sunday, hardly encountered resistance from a visibly outplayed PayMaya side, particularly in the third frame which they literally took with ease. Alyssa Valdez, relishing her first championship since winning in the defunct V-League Reinforced Conference in 2015, fired 19 points built on 15 kills, three aces and a kill block while Michele Gumabao and Thai import Kuttika Kaepwin backed him up with 12 hits apiece and American reinforcement Laura Schaudt added nine markers. Ace playmaker and Best Setter winner Jia Morado later took the Finals MVP trophy after tallying 29 excellent sets for the Cool Smashers. Morado averaged 8.7 excellent sets per frame in the finals. American Tess Rountree put in 12 points for PayMaya which drew just six markers from Grethcel Soltones. BanKo-Perlas repelled Pocari-Air Force, 23-25, 25-10, 25-14, 25-17, to clinch third place honors via superior quotient. The Lady Warriors took the opener of their best-of-three series for third in five sets. “It’s been a while since I last won a championship. It’s quite memorable since I’m still with some of my Ateneo teammates (Morado) and coach (Tai Bundit),” said Valdez, who also considered their title romp the turning point of her pro career. Valdez had earlier vowed to help bring the first championship after two third place finishes in last year’s inaugurals of the league organized by Sports Vision and backed by Mikasa and Asics. Simply put, the Cool Smashers were head and shoulders above the High Flyers in a game the latter couldn’t afford to lose. No amount of persuasion or motivation could prop up the High Flyers, who lacked the fire in offense and toughness in defense, enabling the Cool Smashers to score almost at will, clinching it on Jerilli Malabanan’s serve that sailed long and sparking a frenzied celebration at Creamline’s court where the Cool Smashers whooped it out as confetti fell from the rafters. The maiden championship also came as a big comfort for Valdez, who earlier conceded the Conference MVP plum to Pocari stalwart Myla Pablo, who normed 16.5 points in the prelims with a 39.09 percent success rate in attacks. The former NU star also took the second Best Outside Spiker award with Valdez bagging the first Best Outside Spiker honors during awards rites. Other awardees were Pocari’s Jeanette Panaga (1st Middle Blocker), BanKo’s Joy Dacoron (2nd Middle Blocker), Creamline’s Michele Gumabao (Best Opposite Hitter), Morado, also of Creamline, (Best Setter) and PayMaya’s Lizlee Ann Pantone (Best Libero). Tess Rountree of PayMaya took the Best Foreign Guest Player honors while Kia Bright of BanKo-Perlas received a special recognition (Most Points Scored in a Game) – 41 points in Games 3 of their semis loss to PayMaya.